I joined a bunch of aspiring traders to see if I could make it big on the stock market. Trading has a certain glamour to it – making your own money without dealing with fund managers, or having to accept the awful rates on savings accounts. Plus, there’s the sector has gained a certain exciting notoriety since the crash, and more recently the hype around cryptocurrency. So when I was offered a chance to learn how to trade, at a company run by a trader barely older than myself, I was never going to turn it down. That’s how I came to spend two days in Watford, on the Junior Trader Programme run by Samuel & Co Trading, learning about stocks and shares, foreign exchange (Forex) trading and much more. Here’s what I learnt about trading and about traders. Needless to say, this is not financial advice to be relied upon (read on and you’ll see why), but it is for anyone who’s ever tried, or simply considered trying their hand at trading. “Within two weeks you could have a £60,000 fund at your disposal” our instructor Atish Patel tells us. Patel, like almost everyone else in Samuel & Co’s office, had completed the Junior Trader Programme. The Programme is relatively unique in that participants can get real money – up to £20,000 or more – to trade with, providing they show consistency in their trading. The 10 participants ranged from an experienced Maltese financier to a swimming pool lifeguard; almost all had tried trading with real money or free ‘demo accounts’ – imaginary money - and all were men. They were hoping to learn to trade stocks, shares and forex and ultimately follow the example of founder Samuel Leach. During his university years, Leach had managed to amass £250,000 from trading; he now drives an Audi R8 and runs a trading group that stretches to Madrid. Leach is selling a system – one that supposedly gives participants the techniques to generate consistent returns, and Leach gives them the initial capital to actually make money. There are plenty of seminars and websites out there offering financial freedom. To be fair to Samuel & Co, the first day was all about challenging misconceptions. My first misconception was about the office itself. Contrary to what I’d been promised by the Wolf of Wall Street or the Big Short, I saw no yelling into telephones or slamming of desks and, whilst the nearly silent room of traders had four to six computer screens each, these were as likely to be on Facebook as the latest financial bulletin. In fact, that’s part of the point, Patel, our instructor, explained: traders need to be emotionally detached from trading. In essence, that meant not relying on a trade going well and that meant having other sources of income. Patel owned a restaurant and urged the participants to diversify their money – Premium Bonds and gold were discussed, as well as investment trusts and algorithmic trading. 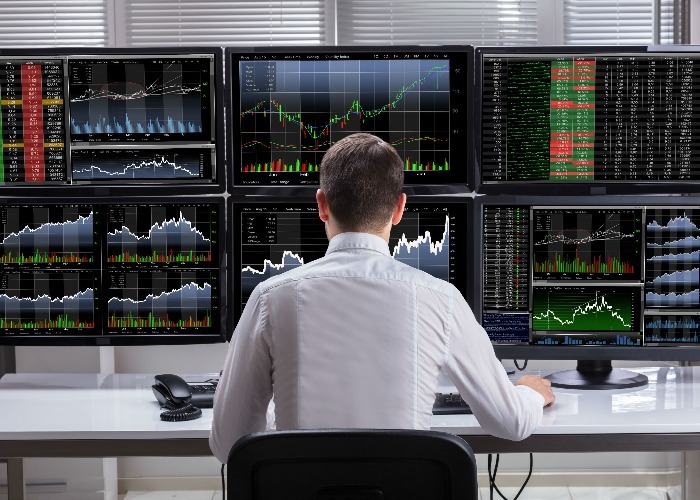 These traders might spend as little as 15 minutes a day looking at stock charts and the occasional glance at forex opportunities, sitting in front of a screen was discouraged on the basis that it could lead to risky ‘overtrading’ or even ‘revenge trading’ (effectively chasing losses). In fact, many traders would make just a couple of ‘entries’ (buying or selling stocks or forex) a day; these were retail traders and happy to remain so. Making a trade is all about calculating and managing risk. He utilises a variety of methods to stop that happening, such as always using a ‘stoploss’, where you automatically sell if the market moves too far against you, various investment criteria and caution when picking brokers (they should be FCA authorised). “There’s no such thing as a winning trade”, insisted Patel: you need a risk management system and the ability to take a loss when things went wrong. Learning to take a loss is a matter of psychology, not just finance, and it was the psychological part of the Junior Traders course which was the most intriguing. The five-day course includes two days with mind coach Adrian Leach, Samuel’s father, where participants’ mental weaknesses are discussed and dealt with. Traders suffer from a variety of problems, he told me, unsurprisingly including greed – which manifests itself in risky trades and holding positions for too long in the hope of unrealistic gains. At the other end of the scale – one including myself – are those that are terrified of loss, preventing them from making the trades they need to make money. Only once traders have learnt to manage these problems, claims Leach, can they achieve the consistency needed to make money over the long term. As you may have guessed, I didn’t make it to the end of the course, nor did Samuel & Co let me loose with thousands of pounds. This was partially due to time constraints, but I can’t deny that I found trading extremely difficult. Searching through a dense ‘candlestick chart’ (read more about these here) full of data, it’s hard enough to pick out a good opportunity to buy or sell, even in hindsight. Once you simulate a live trade – where you don’t know what’s about to happen – it becomes very tricky indeed, as you can see from the comparison of my chart with the correct example below. The green arrows are where I should have entered a trade. Knowing the financial news and keeping a cool head did not stop me making silly mistakes and although I would only have lost 1% of my pot each time, those losses would have kept coming. Other participants didn’t find it that difficult, however, and although there is a lot of maths involved, the profusion of online calculators and other tools makes this easily manageable. And although the course was packed full of material, it was not particularly pressurised and several times Patel was happy to take tips from the participants present. What the other participants had that I didn’t was a real passion for trading and experience trading on demo accounts, professional experience in finance, or both. I can certainly see the appeal of trading and wouldn’t be averse to playing around on a demo account in the near future – but my dream of escaping the office might have to wait. If you want to learn to trade, Samuel & Co runs a variety of courses, many of them online. You can also watch their instructional videos for free on YouTube. Or you can view more investment options in the loveMONEY investment centre (capital at risk).